Vangi Bhath is brinjal rice or eggplant rice. This dish is famous in South Indian states like Karnataka and Andra Pradesh . 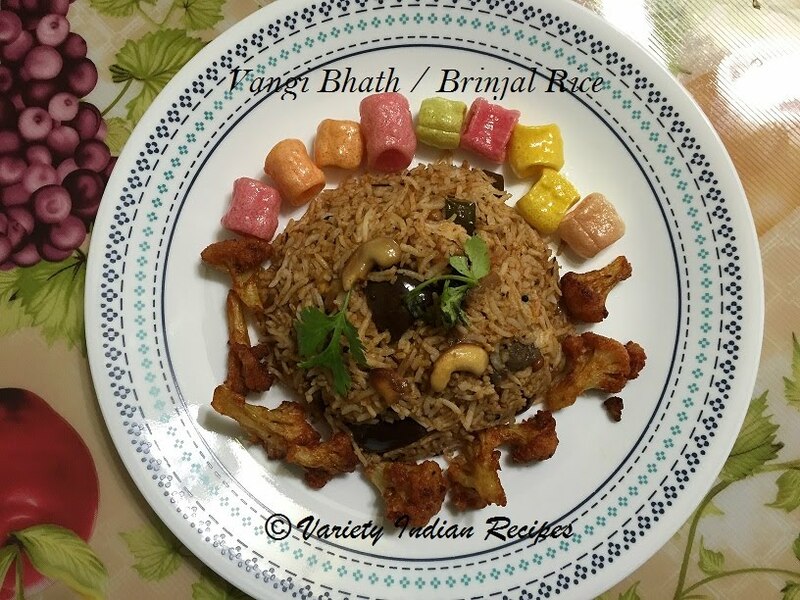 Vangi Bath is a flavoured rice recipe, where rice tossed in spices and brinjal (egg plant). Wash and soak rice in 1 cup rice: 1 and a half cup water ratio for 30 minutes. Cook rice by adding salt and keep aside. Heat oil in a pan, add mustard seeds. Once the mustard seeds splutter, add channa dhal and saute for a minute. Add peanuts and saute until they are slightly browned. Add cashew nuts and saute until they slightly change colour. Add turmeric powder and curry leaves. Add Brinjal (egg plant) and saute well. Allow the brinjal (egg plant) to cook over low flame with closed lid. Stir time to time, if needed sprinkle water for the brinjal to cook. Once the brinjal are soft, add little salt, add the ground powder, tamarind juice, grated coconut and saute well for about 2 minutes. Now add the cooked rice and mix gently until the masala gets coated onto the rice. Cover the rice with a lid and allow to cook for 2 minutes. Now turn off heat, garnish with coriander leaves and serve hot.